The first thing to consider is that 90 percent or more of the insects in our home landscapes are either beneficial or benign. A scant 10 percent of the insects in our yards are true pests. But to control them, homeowners typically use broad-spectrum pesticides, which kill beneficial insects along with pests. This further disrupts the ecological balance in a landscape. An ecologically healthy landscape has an abundance of insects, and that’s a good thing. Insects are part of the food web and are an important protein source for many other creatures. In his book Bringing Nature Home, entomologist and ecologist Doug Tallamy notes that 96 percent of land birds feed insects to their young. If you want songbirds, you need to support the insects they eat. So avoid using pesticides, and instead include native plants in your garden to attract and support the native insects that keep pests under control. These predatory and parasitic insects are often referred to as “natural enemies” and include ladybugs, lacewings, parasitic wasps, assassin bugs, tachinid flies, syrphid flies, and many more species. These valuable garden allies also need nectar and pollen at certain times during their life cycles, or when prey is in short supply. Some native plants that excel at attracting these beneficial insects include yarrow, golden alexanders, mountain mint, joe-pye weed, boneset, and aster. A word of caution: If you are thinking about buying and releasing imported beneficial insects, please don’t. You may inadvertently introduce pests and diseases from another region. The best practice is to plant native plants that attract and support the natural enemies of insect pests. Learn More: Kim Eierman will teach Attracting Nature’s Pest Control at BBG on April 9. Kim Eierman is a certified horticulturist through the American Society for Horticultural Science who specializes in ecological landscapes and native plants. She is also a freelance writer and teaches courses at Brooklyn Botanic Garden and New York Botanical Garden. 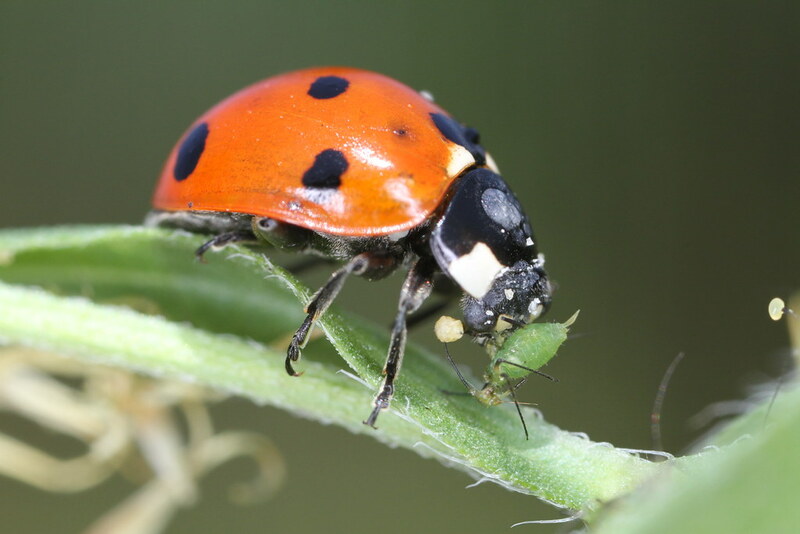 Ladybugs prey on aphids. Photo by John Flannery.